Egypt’s parliament accelerating process of passing constitutional amendments that would allow Sisi to stay in office past current term. 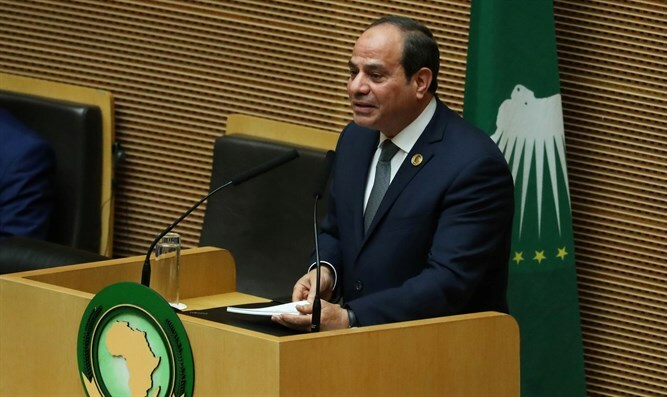 Egypt’s parliament is accelerating the process of passing constitutional amendments that would allow President Abdel Fattah Al-Sisi to stay in office well beyond the end of his current term in 2022, The Associated Press reported on Monday. Sisi led the 2013 military overthrow of Islamist President Mohammed Morsi of the Muslim Brotherhood, following calls on him to go. He swept to another four years in office against in the country’s elections in March of 2018, pledging to tackle the raft of security and economic challenges facing the country. Sisi has in the past indicated, however, that he would not seek a third term in office, noting the country's constitution permits its leaders to serve only two four-year terms. A constitutional amendment to extend Sisi’s rule would add to concerns that the country is slipping back into authoritarianism eight years after a pro-democracy uprising ended Hosni Mubarak's nearly three-decade rule. The 596-seat parliament gave its preliminary approval to the amendments last week. The motion is virtually guaranteed to be approved by the legislature, which is packed with Sisi’s supporters. A coalition of nearly a dozen opposition parties has come out against the proposed amendments, but on their own they would not be able to block them, noted AP. Sisi has led the crackdown against the Islamist insurgency in the Sinai Peninsula, where the local Islamic State (ISIS) affiliate has carried out countless terrorist attacks since 2014. Egyptian forces have since February of 2018 been waging a sweeping operation against the local ISIS affiliate in North Sinai province.